Ms. Goofy, for my birthday last February gifted me a voucher for Snake River Farms. Snake River Farms is famous for their premium American Waygu beef products. A good number of bbq competitors are using SRF’s products in competition. They are winning with this product and there is a reason. It is some of the best beef around. A whole brisket will set you back two hundred dollars plus. We have cooked this brisket before with stellar results. Ms. Goofy generously gave me this gift certificate and let me choose anything I wanted. I have never had a Manhattan Roast. 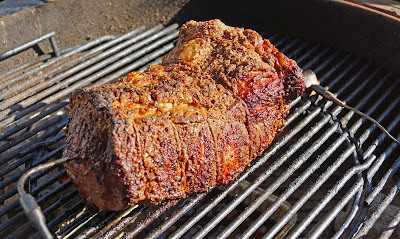 I bet you are wondering what a Manhattan Roast is? 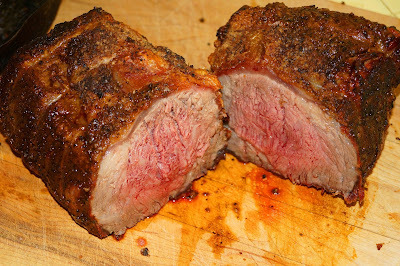 The Manhattan Roast is cut from the same tender area as the New York strip. It weighs from 2.5-3 pounds. It is trimmed and tied with butcher twine to keep its ‘artisan’ cylinder shape. This also creates simple carving duties. Let me reel off some attributes of this roast given by SRF. 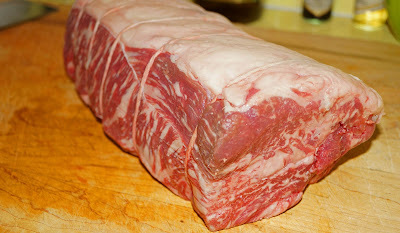 Look how beautiful the marbling throughout this roast is. To be honest, I am a little afraid to cook this for several reasons. The price tag of this roast is so very high and just a small overshooting of a temperature target could ruin this roast. I actually wanted to cook this in our indoor oven for more consistent heat but it is late summer and the house is just too hot. We opted to cook it on our covered kettle. You know I will be monitoring this cook like a newborn child; my meat baby. We used an indirect heat with a drip pan under the roast. A simple liberal dusting of salt & freshly ground pepper to only accent the meat was used. My target temperature was 115-120 degrees. My alarm went off and I took it off for a 15 minute resting period. The smell alone made us drool. This is premium beef that begs to be experienced. Ms. Goofy proclaimed this to be some of the tenderest beef ever. The beef flavor is so deep and rich. A quality of Wagyu beef is a lushness that is savored in each and every bite. Umami (not my favorite term) creates a longing to experience your next bite with each and every bite. This roast was all that and more. Ms. Goofy you are the greatest.